The hit BBC prime time show Strictly Come Dancing has become on of the biggest reality shows in the calendar, with it's soaring popularity driving more and more interest in ballroom dancing. The Strictly Come Dancing live show will visit some of the biggest entertainment venues in the UK! Don’t miss your chance to experience the energy and excitement of Strictly Live. 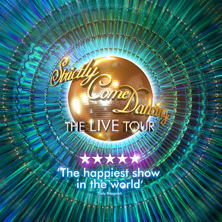 Eventim is the place to find Strictly Come Dancing Live tickets and tour dates. To be the first to hear when more Strictly Come Dancing Live tickets go on sale you can sign up to the Eventim Ticket Alarm below. This multi million pound production brings the Strictly magic to fans around the UK. The ultimate in feel-good entertainment, Strictly Come Dancing Live features all the must-haves from the hugely popular BBC1 TV series. Stunning costumes, outspoken judges, dazzling dances from your favourite celebrity contestants and some brand new routines courtesy of the ever-popular professional dancers make this a must-see show that is sure to bring a smile to your face and beat away any winter blues.